Here you'll learn several suggested techniques to effectively clean silk flowers, foliage and artificial plants, with tips for getting best results. We'll also discuss cleaning precautions based on the materials and construction of artificial flowers and greenery. First, let's toss out the simpler techniques that you may be tempted to try. These might work when cleaning silk flower arrangements or loose stems with a very small accumulation of dust. If you want to clean silk flowers, artificial plants and greenery FAST, and have them looking like new again in minutes, you can buy silk flower cleaning sprays that are specially formulated to dissolve dust on contact. Very easy to use — spray on and watch the dust disappear. Be aware that some users have warned that silk flower cleaning sprays don't always work as expected — they may seal the dust and dirt onto the fabric instead of removing it. Brands and prices vary. On average, a 16 oz. spray bottle costs about $4, whereas the cost of a 12 oz. aerosol spray may be $8 or more. Other users suggest buying a can of compressed air, and attempt to blast dust away with a powerful burst of directed air. This may work better than a blowdryer or vacuum for removing loose dust, but it still won't remove built-up grime — and a hurricane blast of air may loosen or dislodge glued parts. Okay, those are simple methods for quick cleaning — you don't have to dismantle an existing artificial flower arrangement or plant display. But, if you've got some time and want to do a thorough job of it yourself, there are other, more vigorous techniques to clean silk flowers. Let's go over some precautions before proceeding. There are certain artificial flower assembly or manufacturing processes that may not stand up well when stronger methods to clean silk flowers are attempted. First, let's take a closer look at the silk flower stems and foliage that you wish to clean. Are the blossoms and leaves made of a fabric (silk, polyester, velvet), plastic, or do they have a latex finish? Does it look like petal details might be hand-painted? Does the stem look and feel like it is hand-wrapped with a floral tape, or is it formed of molded plastic? Next, check the undersides of petals and leaves. Does it look like they were glued to their supports — a thin wire, or a plastic 'branch'? How are those parts attached to the main stem — wired, taped, snap-on? Our concern is if there is a possibility of ruining fabrics and finishes, or dislodging delicately assembled parts. Take your findings into account if you wish to try cleaning your beloved silk flowers and plants with the following techniques. It's up to you to decide the level of risk, if any! These methods may involve partial dismantling of an artificial floral arrangement. Remove one stem or several at a time, whatever you are comfortable with. Clean and replace these stems before removing others. Shaking artificial floral products in a bag with a half cup of salt or cornmeal can remove dust from most surfaces, even hard-to-reach areas. The grains act as little scrubbers. Shake the item in the bag gently for a minute or two, repeat if necessary until satisfied. If you don't want to remove any elements from a silk flower arrangement, and you think the assembly and fabrics can withstand some moisture, you may want to try filling a spray bottle with a 50/50 mixture of water and white vinegar to clean silk flowers. Position paper towels or newspaper around the base of the display to absorb drips and spray, then spritz away. You probably guessed this was coming! No getting around it — this is probably the most effective technique to clean silk flowers that have a heavy coat of dust — if you think they can take it! It is recommended to remove, clean, then replace artificial floral stems one at a time if you are refreshing a silk floral arrangement. Test for colorfastness if you are not sure. - Fill the sink or a receptacle with COOL water (hot water may melt any glue that was used on wired petals or plastic leaf supports). Add a squirt of dishwashing detergent and mix. - Take your stems out one at a time and swish gently in the water. Remember, some elements may be glued together, like the undersides of leaves, and we don't want them coming apart. If there are stubborn areas of grime, you may rub them very lightly. - When the item is clean, BLOT dry as best you can on a soft cloth — do not rub! Replace in the arrangement and continue with the rest. Now, stand back and admire your clean silk flowers! P.S. If your silk flowers and artificial greenery are in really bad shape, why not discard them and treat yourself to new ones? It's time for a change! 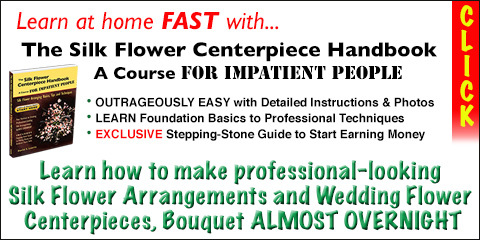 More FREE Silk and Artificial Flower Coaching!